Area of interest: Tin mining in West Penwith until 1991. Opening times: Sunday to Friday throughout the year from 9:00am onwards. Check with the museum for Christmas holiday closure dates. Current admission details: Adults £7.50. Senior citizen £7.00. Child/Student £4.30. Ex-Geevor Staff and Pendeen CH members free. NAMHO organisation members 10% off. Educational facilities: Educational package structured to visiting group requirements. Contact Bill Lakin. Archive collection: Archives of Geevor Plc (1911 to 1991) available on request. Prior notice needed. Artefact collection: Museum is open to all visitors. (ii) Complete restoration of site buildings. (iii) Increase visitor access underground. Location: Located at Pendeen, Cornwall at NGR SW 370 340. How to get there: Take the A30 road to Penzance. At Penzance take the A3071 and after about 6 kilometres take the B3318 to Pendeen. Buses from Penzance stop at the site. 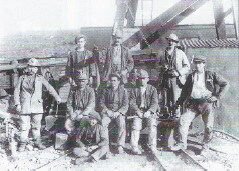 Last updated: 30/10/2017	 Left: Geevor miners at Wethered Shaft, 1920s.